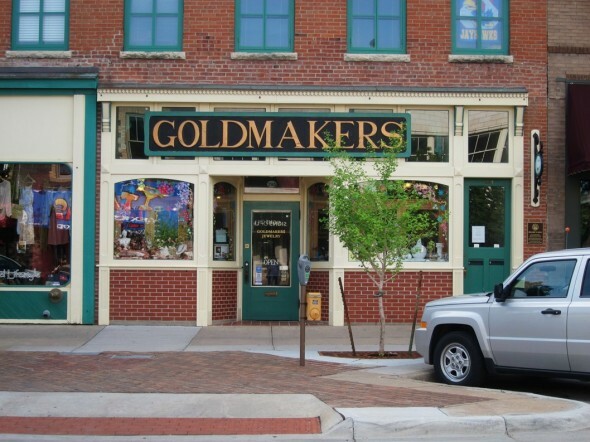 With a name like Goldmakers, you know you’re in for a treat once you step in the door. This tasty little jewelry shop has been dazzling Mass Street for over forty years! I made the mistake of visiting this boutique for the first time without being prepared to make a purchase. Needless to say, I had determined intentions to return as soon as possible. Now that's a jewelry store sign. Gold and Bold. The interior is just as refreshing and brilliant as the jewelry. It’s enough of a challenge to pass by this shop without getting seriously slowed down by their fanciful window displays, but forewarning if you decide to enter, you’ll easily lose 30 minutes of your day. The store reminds me of an art gallery, displaying each piece so carefully and respectfully. The sunlight floods the space, illuminating each case of jewelry. The ceiling – I loved – is a fresh color of teal, showcasing the intricacies of the tin coffered ceiling. I found myself gaping at the slender necklaces, rings and earrings behind glass cases, wishing I could try on each one and play make-believe. While some of their jewelry is made in house, they also have jewelry from dozens of different designers across the country in a friendly variety of price points. In the end, it was a sparkly ring that called my name and stole my heart. 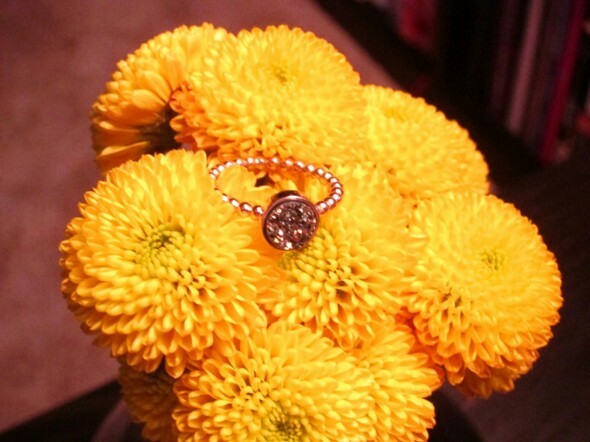 The designer is Dara Ettinger, and the ring is drusy set in gold vermeil. It was handmade in L.A. and found its new home on my right-hand ring finger for a cool $69.66 (total). The drusy quartz that stole my heart. Goldmakers is open 10-6 Monday-Saturday, 10-8 Thursdays, and 1-5 Sunday. This entry was posted on Monday, April 9th, 2012 at 3:36 am. It is filed under Businesses and tagged with gold, Goldmakers, jewelry, shopping. You can follow any responses to this entry through the RSS 2.0 feed. As the husband… I definitely don’t like this store.